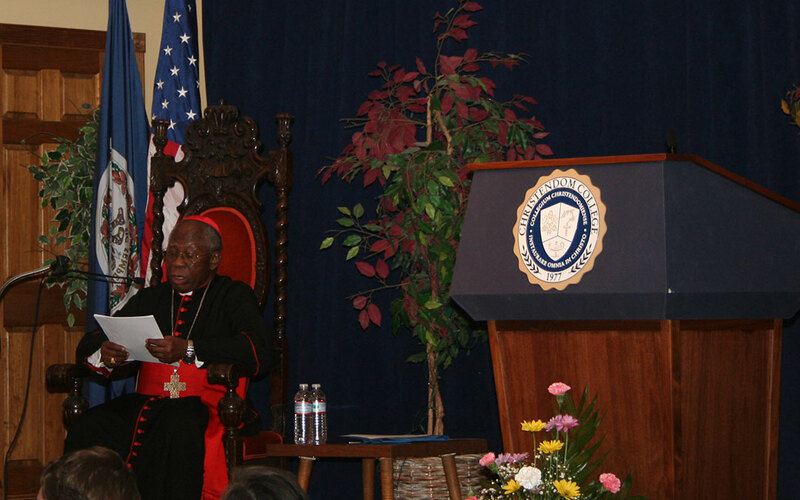 Francis Cardinal Arinze, Prefect Emeritus of the Congregation for Divine Worship and the Discipline of the Sacraments, delivered a talk entitled “The Year of Faith and the Apostolate of the Laity” to the students and faculty at Christendom College on February 4, 2013. Cardinal Arinze was ordained a priest in 1958 and was consecrated bishop in 1965. In 1979 his brother bishops elected him president of the Catholic Bishops’ Conference of Nigeria, a position he held until 1984, when Pope John Paul II asked him to serve as president for the Secretariat for Non-Christians (now the Pontifical Council for Interreligious Dialogue). One year later, he was appointed Cardinal by Pope John Paul and, in 1999, he received a gold medallion from the International Council of Christians and Jews for his “outstanding achievements in inter-faith relations”. From 2002-2008, he served as Prefect of the Congregation for Divine Worship and the Discipline of the Sacraments. Cardinal Arinze remains active as a highly-sought speaker and catechizer, being featured in programs and events that cover Pope John Paul II’s encyclicals and apostolic letters, Vatican II, and many other topics. He is also the author of several books and has been a frequent guest on Christendom’s campus.